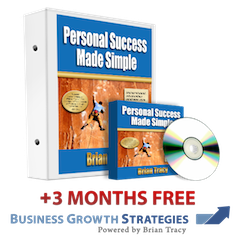 Introducing, Brian Tracy's "Personal Success Made Simple"
You Have More Potential Than You Could Possibly Use in This Lifetime...Wouldn't You Like to Unlock It? Do you ever feel like the life you truly want is just out of reach? If you’re like so many of the goal-oriented, driven people I talk to, you know you’re destined for something bigger and better — but you just don’t know where to start or how to get there. You wander through life aimlessly, rather than designing your own circumstances, and you put off taking actions you know could lead to the future you want, because you’re afraid it may not meet your expectations. Every time you DO begin making the progress you desire, some factor outside your control thwarts your efforts. Fear and self-doubt are your constant companions, and they stop you from making positive change. So many of us operate on our early programming, which tells us to view life as a set of constraints in which we must operate. But it doesn’t have to be this way. I have good news: there IS a solution — and it’s so simple you might be surprised. "Personal Success Made Simple," a training program based on my proven, working system for maximum achievement. This set is quite simply one of the most valuable and inspirational tools I have EVER purchased! The set is truly an education in how to be successful in life and provides very practical ways to achieve your goals. When you reprogram your mind and shift your mental paradigms, you operate from a place where anything is possible. During the past 4 decades, I have developed a system — and I’ve put it to use in my own life. It will help you develop clarity on what you want and who you are, cultivate the self-esteem and confidence you need to take action toward your goals, and practice the discipline necessary to do everything you must to achieve your goals. Order “Personal Success Made Simple” now and get started! In short, you discover everything you need to know to move quickly, steadily forward toward a life YOU create — the life of your dreams. Ready to get started? Order “Personal Success Made Simple” here, now! 3 months’ membership in our Business Growth Strategies Online Learning/Training program — a personalized online learning program tailored to your specific personal and professional needs. You get access to a comprehensive, customized learning program, including high-powered video lessons, action exercises and sales strategies — absolutely free. Improve your negotiation skills so that you can immediately increase your sales and sky-rocket your success and income to new heights. And I guarantee, if you implement what you learn here, even in the first lesson, you’re going to easily increase your income again and again, month after month, year after year — doing more of what you love. 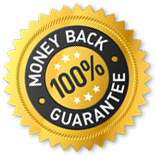 But just in case it’s not a no-brainer for you, remember you’re covered by my 100% Satisfaction Guarantee — that is, buy the product, try it for 90 Days, and if it doesn’t meet your expectations, you can return it for a full refund. No questions, no hassles. If you are truly ready to stop wandering aimlessly through life and to start defining what you want and going after it with determination, tenacity, and a PLAN, then this is your time! It’s time to become unstoppable. Order “Personal Success Made Simple” here! I listen to this program while driving. You'll learn to tap into the power of my subconscious mind in order to accomplish your goals. Highly recommend this and all Brian Tracy programs. You'll improve your life! I've read and listened to many of Brian Tracy's books, video and audio programs. However, if you haven't already listened to, viewed or read any of his material, this is the best place to start. Personal Success Made Simple is a clear, straightforward introduction to personal development. So what are you waiting for? Get it!